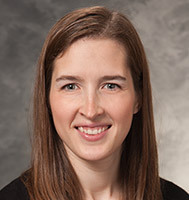 Meghan Furstenberg-Knauff is an advanced practice provider in the Department of Neurology. She works within Pediatric Neurology. Typically, a child is seen in clinic will work with both a physician and Meghan, alternating visits between the two. Meghan sees patients with epilepsy, headache/migraine, and tic disorders. She also sees patients undergoing ketogenic therapy and programs and manages Vagus Nerve Stimulators (VNS). Meghan educates families seen in Pediatric Neurology with new diagnosis and sees patients for their hospital follow-ups in clinic. Meghan has lectured at the University of Wisconsin College of Nursing, University of Wisconsin Physician Assistant Program, and at the Wisconsin Nurse Association School Nurse Conference. She also welcomes nurse practitioner students for preceptorship.